It all started at lunch in New Bedford at Ray and Joe’s Restaurant in 1972. Bill Saltonstall of the Beverly Yacht Club and Bob Saltmarsh of the New Bedford Yacht Club commiserated that the numbers of boats entering their clubs’ regattas were dwindling each year. Each club had its own classes (BYC had H12s, Yankee One-Designs, Tempests and New Bedford had Beetle Cats, Rhodes 19s), so that when an individual club held a regatta, very few boats from other yacht clubs came to race. 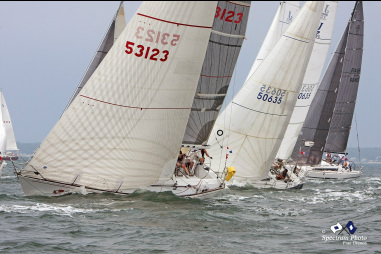 They decided that it would be a good idea if all of the yacht clubs around Buzzards Bay would get together each year to sponsor one large regatta. That way, they could attract the best boats in each class to race against each other. Messrs. Saltonstall and Saltmarsh decided that each of the two largest yacht clubs, Beverly Yacht Club and New Bedford Yacht Club, should host the event every other year, while the other yacht clubs, Low Tide Yacht Club, Mattapoisett Yacht Club, Angelica Yacht Club and Wild Harbor Yacht Club would provide race committee assistance. (See the listing of future dates.) They brought their proposal back to their respective yacht clubs, who eagerly endorsed the concept. Dave Johns, an active sailor and race organizer at the BYC, was an early and key champion of the event. The regatta’s highest award for volunteer service is named in his honor. The planning for the initial Buzzards Bay Regatta in 1972 required hard work: There were multiple handicap classes, five or six Olympic circles to accommodate twelve different one design classes, six or seven separate fully-manned race committee boats, mark setting boats, crash boats and judges’ boats. That first regatta was a huge success, attracting a fleet of 199 competitors. Thus began a great tradition that has gained momentum and developed a well-earned reputation among sailors across the country. The intersection of great sailing conditions and highly-competent race management is the promise offered by the BBR. On behalf of the BBR, the Beverly Yacht Club was awarded US SAILING’s prestigious St. Petersburg Yacht Club Trophy for race management excellence in 1982. While the regatta has grown in size and reputation, the original goals of the BBR — to attract top-level competitors and race committee officials to our area while allowing Buzzards Bay clubs to come together and compete at a single venue — are being fulfilled many years later. We invite you to join us this year to experience this great event.